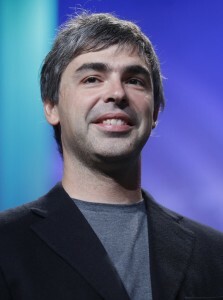 Larry Page (b. Lawrence Page March 26, 1973) is an American Internet entrepreneur and computer scientist. He is a co-founder of Google with Sergey Brin. In April of 2011, Larry Page accepted the title of chief executive officer of Google. His predecessor was Eric Schmidt. Page’s current wealth is estimated at more than $23 billion, which puts him in 13th place among the 400 richest Americans according to the Forbes 400 list. In 1998, Page and Brin founded Google, Inc. Page and Brin first met in March of 1995 during an orientation for new Ph.D. candidates of Stanford University. The original version of Google was first installed on the Stanford University website. They hired Eric Schmidt as CEO and chairman of Google three years later. In January of 2011, it was announced that Schmidt would step down and be replaced by Page in April of that year. Notably, each man receives an annual compensation of just one dollar. Page is also a member of Google’s Board of Directors. Larry Page is most notable for inventing PageRank, which serves as the foundation of Google’s unique search ranking algorithm. Page and Brin now own about 16 percent of all stock in Google. Larry Page was born and raised in East Lansing, Michigan. His father Carl is considered a pioneer in the field of computer science. Both Page’s father and mother worked at Michigan State University as computer science professors. In 2007, Larry Page married Lucinda Southworth on the Caribbean island Necker Island. Southworth works as a research scientist. The couple has a son. On the Forbes list of billionaires, Larry Page ranked 20th in March 2013. Additionally, he ranked 13th among Americans. The Bloomberg Billionaires Index places Larry Page as the 27th richest person in the world. His estimated net worth is more than $23 billion. Larry Page was given an honorary doctorate in 2009 from the University of Michigan. Larry Page graduated with honors from University of Michigan with a bachelor’s degree in computer engineering. He then completed a Master of Science from Stanford University. After his admission to Stanford University as a Ph.D. candidate, Larry Page was undecided on his area of concentration. He eventually chose to explore the Internet and its mathematical properties. As Page made progress on his dissertation, he and Brin further developed the PageRank algorithm. At this time, the Internet contained more than 10 million documents, with an unknown number of links existing between them. The two men set a goal to build a search engine that surpassed all others, which led to the creation of Google, Inc. in 1998. As the co-founder of Google, Larry Page has earned numerous awards and accolades for his work. PC Magazine lauded Google as one of its Top 100 Websites and Search Engines, and selected Google as recipient of its Technical Excellence Award for Innovation in the field of Web Application Development. During its history Google has secured multiple Webby Awards for outstanding achievement online. Their first award came in 2000, the People’s Voice Award recognizing technical achievement. In 2001, Google was honored with multiple prizes at the Search Engine Watch Awards: Best Search Feature, Friendly Search Engine, Best Image Search Engine, Outstanding Search Service and Most Webmaster Friendly Search Engine. The World Economic Forum named Larry Page as a Global Leader for Tomorrow in 2002. During that same year, he and Brin were listed on the MIT Technology Review TR 100, which ranks the top 100 innovators worldwide 35 and younger. Page and Brin were both presented with an honorary MBA in 2003 from IE Business School. That same year, the two men also received the prestigious Marconi Foundation Prize, and earned election into the Fellows of the Marconi Foundation at Columbia University. In 2004, Page and Brin were featured on ABC World News Tonight as the “Persons of the Week.” Page and Brin also maintain their status as Fellows of the American Academy of Arts and Sciences. Larry Page is a trustee on the X PRIZE board of directors, as well as a member of the National Academy of Engineering. Page has been named as a Global Leader of Tomorrow for his advancements in technology. Larry Page is one of the investors in Tesla Motors. He is most focused on technology for renewable energy sources. With the assistance of Google.org, Google’s philanthropic department, he promotes the use of plug-in hybrid electric cars, along with other forms of alternative energy.